Part 2. Project 2. Exercise 1. Still life using line. For this piece I tried to draw using no tone at all, just surface texture and shape. I also tried not to outline the object but to express its shape using the pattern of its surface. It was quite good fun as an exercise but I’m not sure if there is any advantage to drawing in this way. It was too frustrating not being able to use tone. 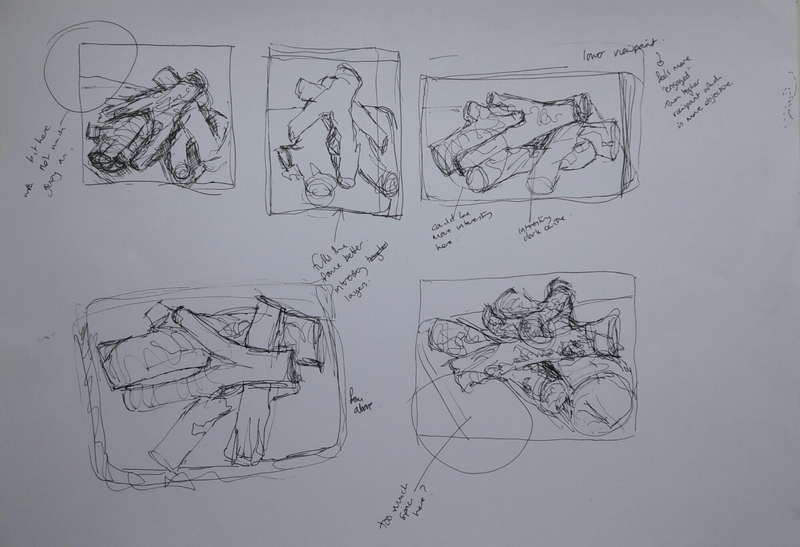 I also changed the angle from the last few drawings – looking down on the arrangement gave more of a view of the grain of the wooden objects. I changed the view of the arrangement to the side of the tray which I think makes it more dynamic than the front. I also used a dip pen and ink rather than a drawing pen which gives the drawing a rougher finish. Using a dip pen is closer to painting than using a pen. Author ewilsonartPosted on December 8, 2016 January 9, 2017 Categories Exercise 1. Still life using line5 Comments on Part 2. Project 2. Exercise 1. Still life using line. I wanted to spend time looking at composition as it’s an area where I don’t feel very confident. I started with a group of logs and played around with the composition. I discovered that the compositions viewed from low down seemed more intimate than those viewed from higher up. I wasn’t happy with any of the compositions and decided that as the logs were very similar there wasn’t much variation in the image. 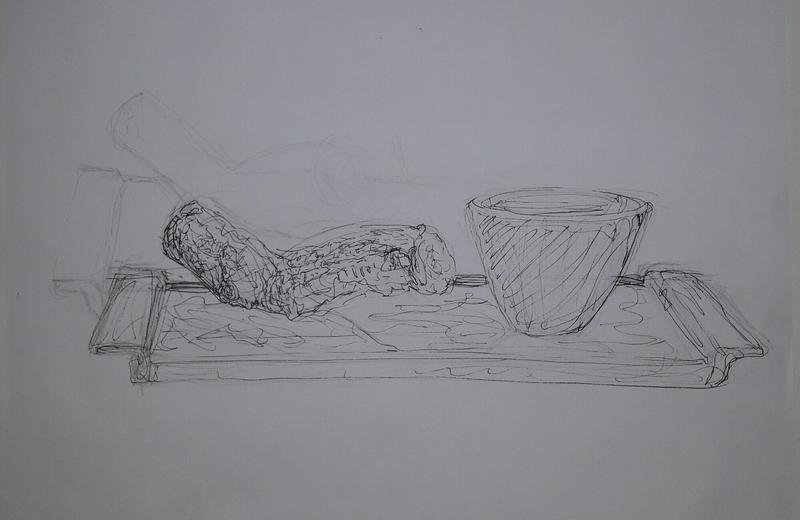 Next I set up a composition with a log, a turned wood bowl and a wooden tray. I liked the contrast between the textures and shapes of the objects . No 2. The simplified line reflects the lack of texture on the bowl and tray. The perspective went wrong on the left hand side of the tray. I was finding the composition very difficult to depict in line. Especially the bowl. I came to the conclusion that I had made a mistake by lighting the composition from behind with bright daylight. This meant the front of the bowl was in shade and the top of the tray shone obscuring the grain. I also struggled with the perspective on the tray. In conclusion , I found this a frustrating exercise although I have learned something about composition and lighting. 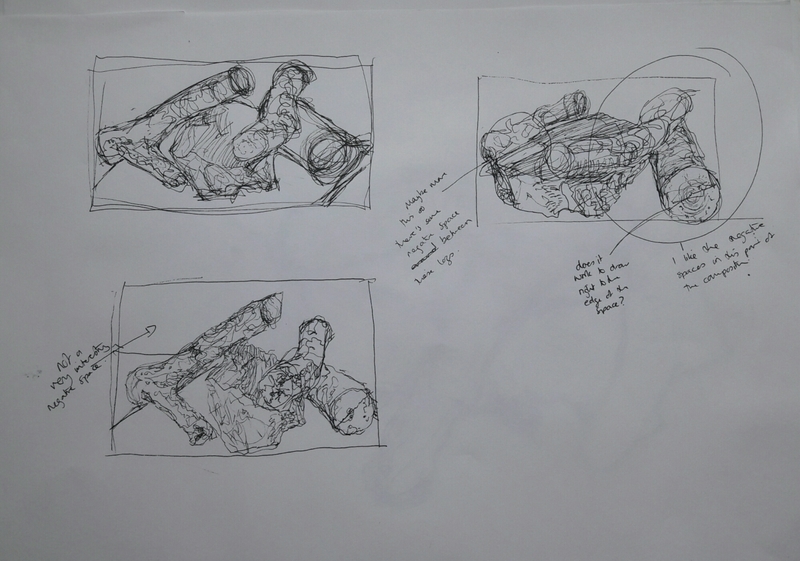 To do: Redo the drawing with lighting which shows the grain of the tray and bowl. Pay attention to the perspective of the tray. Put in some indication of the surface and background around the composition.